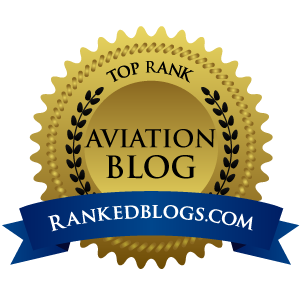 There are a few important things that happen in every pilot's flying career that you never, ever forget. 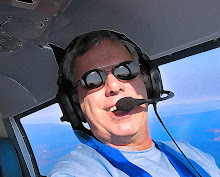 These are the times when your flying memories are made, when you are able to achieve something important or make an impression on a friend or family member. This weekend, my only granddaughter turned 19 months old. Without much prompting, she has taken to anything involving airplanes, mostly toy ones to chew on as an infant, or big plastic ones to ride on as a toddler. Of course, we all knew that at some point she would be introduced to Katy, the family Piper Cherokee 235, a.k.a "DooDah's plane", a reference to my official grandparent name. With all family members in town for Mother's Day, and clear + 1,000,000 weather, we all knew this would be the time my granddaughter and Katy became friends. At the airport – which was quite busy due to the nice weather – my granddaughter was having a hard time not smiling at everything. She could spot a 172 on final from 10 miles out, so it seemed. She grinned wide when we slid open the hangar doors and she saw Katy, as if she knew this was a special day. After securing the car seat in the plane, we loaded the precious cargo in. My grandaughter still would not wear the headset, so we fired up anyway, and she seemed to LIKE the sound of the engine. Not sure about this, but as soon as the engine fired, I swear I heard her try to say something like "Oh, a Lycoming 0-540, good compression, sounds good...smooth! Two hundred thirty five horses...is that a normally-aspirated B2B5?" The fact that she seemed to like airplane noise was, in my world, a huge deal. Lined up on the numbers ready to depart Eugene's 16L, I glanced to the right seat and asked my granddaughter's dad "are we go?" He had his daughter in his field of vision, and was convinced their daughter was fine with it all. Maybe it was because I was only partially turned around to the back seat, but I SWEAR I saw a tiny thumbs up appear from the area of the baby's car seat. I firewalled the throttle and we blasted off to get this party started. It was as if my granddaughter had done this before, and even with the occasional fairly significant bump, she was content in this new world, soaring over downtown Eugene, staring intently out this new window on the world. Sure, she has flown commercial before, but we all know the sensation of flying GA is far more surreal and rewarding. It was clear my granddaughter was enjoying every second of the flight. Back on the ground, we all celebrated the day, one I will never forget. As I have said before, I never plan on shoving flying down anyone's throat. 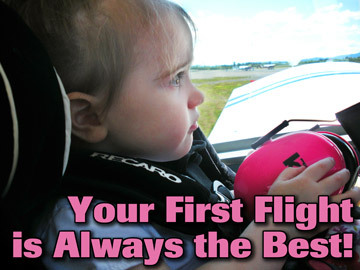 Whether my granddaughter ends up being attracted to the sky and eventually to a pilot's license remains to be seen, and certainly we can all agree that she probably won't remember this flight. But we have successfully opened the door now so there is going to be a next flight, and one after that, and one after that. On one of those flights, she will be old enough to remember every detail of that journey to go up to dance with clouds. If a fire is going to be lit in this future woman's soul to become an aviator, it might happen on one of these fun flights with her DooDah...that would be me. And if – like her DooDah – she determines that the desire to fly has somehow been woven into her DNA and she does end up enjoying a long, luscious career coaxing flying machines to carry her aloft, I want to get partial credit for this one, for this girl, with wings. And, years from now, when I can no longer pass a medical, I'm going to consider that if she ends up as a pilot, she will be my official replacement, so the GA community sees a net loss of zero. This is, after all, our legacy, to plant seeds, light fires and take kids flying whenever we can...because we have to if GA is to survive for generations to come.